France outside Paris: Interior of Rheims Cathedral, France. Interior of Rheims Cathedral, France. The kings of France were traditionally consecrated in this cathedral, starting with King Louis IX (Saint Louis), who was crowned as a child of 12 as the cathedral was still being finished. However, there had long been a church on the site. 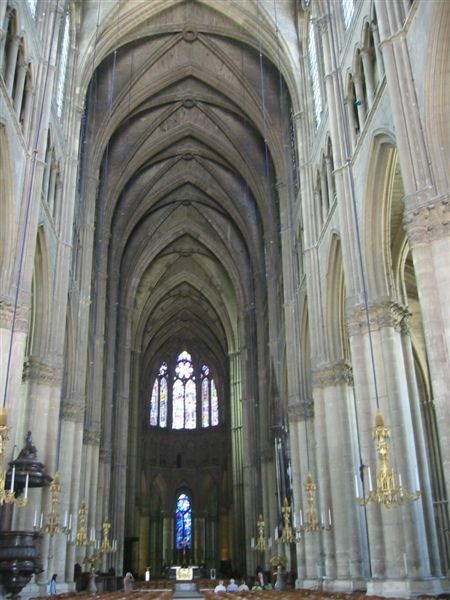 Clovis, the first Christian king of France, was christened here in 496 by Saint Remy, after whom the cathedral and town were named. The first cathedral here was said to have been built by Saint Nicaise, who is now the patron saint of the town of Rheims (now spelled Reims in French). Saint Nicaise was cut down on the steps of his church by barbarian invaders in the early 400s, and he picked up his head and walked off with it to the place where he was later buried. This behavior was so common among saints of the Dark Ages that there is a name for them: cephalophores.